Year three Thanksgiving worksheets and printables keep your seven- or eight-year-old entertained before and after the big dinner! Our collection of year three Thanksgiving printables are great for kids who want to bring some learning into the holiday. Kids will make paper decoration, do word problems, and even study the parts of speech with these Thanksgiving worksheets. There are even year three Thanksgiving printables with fun holiday trivia! 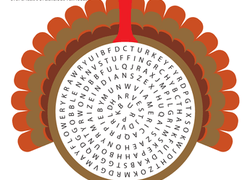 Have a wonderful holiday, full of food, family, and year three Thanksgiving worksheets!